Public policy research typically neglects the role of the individual policy actor with most accounts of the policy process instead privileging the role of governmental systems, institutions, processes, organizations; organised interests or networks of multiple actors. The policy design literature suffers from similar limitations, with very few authors paying attention to the crucial work of the individual policy designer or considering how the latter’s skills, expertise and creativity are employed in the design task. This represents a significant weakness in our understanding of how policy is formulated. 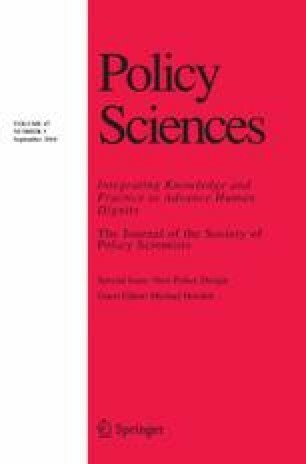 This paper outlines and previews what we believe is a potentially fruitful semi-experimental methodological tool for exploring how individual policy actors draw on knowledge, expertise, intuition and creativity in framing and responding to complex policy issues. Real-time scenario-based problem-solving exercises are used to explore how policy problems and solutions are framed and articulated by novice (first-term politicians and early career bureaucrats) and experienced (former cabinet ministers and senior civil servants) policy actors and to examine the strategies and approaches they employ in response to specific problem cues. Initial findings are discussed, and we conclude by advancing potential refinements of the instrument and directions for future research.